Remove public rights of way from family homes. 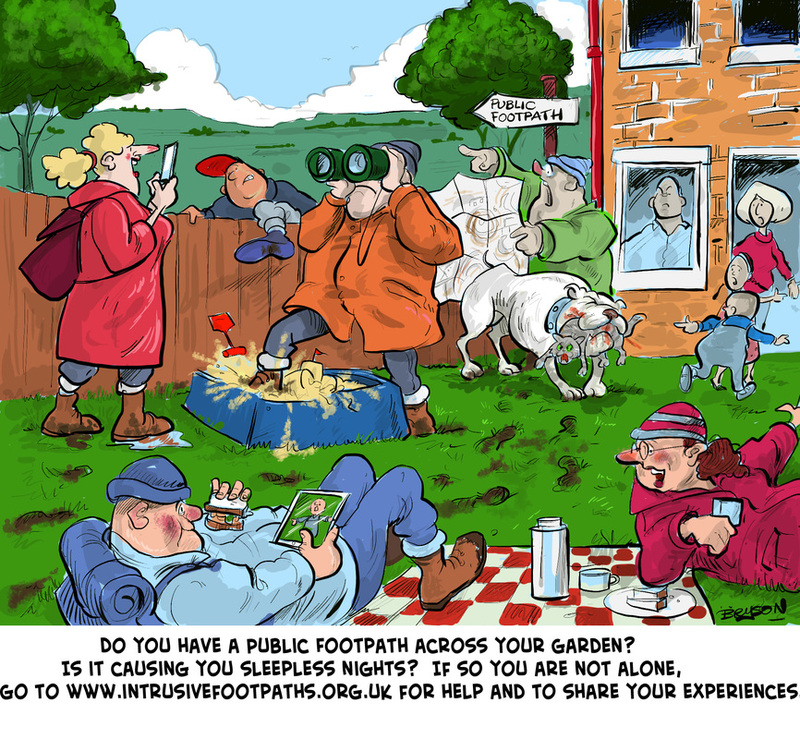 ﻿﻿Intrusive Footpaths is a campaign group fighting for the rights of people who have public footpaths running intrusively through their properties﻿﻿. My partner and I have occupied our property for 48 years. We purchased it from Swindon Council in 1990 and in 1998, we also purchased from them a small piece of overgrown waste land at the bottom of our garden. We were aware of the existence of a now long disused public footpath on this land. The local Council had, previously, extinguished some of this path in 1977 resulting in a cul-de-sac footpath that ended in the middle of our garden. In March 1998, a Council Member made a site visit to discuss various items. He informed us that this piece of land was still subject to Highway rights. He explained that the occupants of the property at the end of our garden would need to be able to access this piece of land, via their garden gate at the bottom of their garden, in order to maintain their boundary fence. He said that, if we agreed, he could make a reference in the Transfer Title. We readily agreed since there had never been any intrusion at all apart from the elderly occupant. He very occasionally ventured out of his garden in order to paint his fence. This arrangement worked well for 18 years and a good neighbourly relationship developed between us and him. This period of time was witness to a steady improvement in our garden facilities. By 2015 (in time for our retirement), we had constructed a large, double glazed and heated conservatory that looked out onto a neat and tasteful garden of which we were both immensely proud. Then, with no prior warning, I was approached by a rather angry wife of the above gentleman and their four adult children with a demand that they will now traverse our garden (to and from their end gate via our side gate) whenever they wanted and we could not stop them. I protested and this resulted in a physical assault upon my person necessitating Police involvement and a crime reference number. This however was merely the start of a campaign of harassment. They persisted in crossing my garden en masse back and forth with up to 8 adults (and dogs) for no apparent reason. They were even crossing at night with torches and allowing their dogs to foul our garden. We then received a letter from their Solicitor informing us that, should we attempt stop them (and/or their visitors) then they would apply for a Mandatory Injunction against us. So now, it became a Legal battle. They persisted in transgressing our garden saying they had every right to do so since it was written into the Deeds of their property. When we started to experience damage to our property, we decided to have a CCTV system installed. It is fair to state that our deeds did, in fact also mention an existing ‘Rights of Way’ from the rear of the aforementioned property. But, it also stated that this Right of Way was reserved solely to assist the local Council in laying pipes, wires and cables under or over our land. During Litigation between our two Solicitors, it transpired after all that this ‘right’ was not, actually on their Deeds. Also, the footpath was only 1.2 metres wide and did not abut any part of our neighbour’s property. Furthermore, there was no mention of any existing pedestrian rights from the rear of their garden, nor had there ever been. However, the transgressions still continued, now recorded. When they became aware that their actions were being recorded, the anti-social behaviour did reduce. By now though, the damage was done. The worry, stress and costs were all having a serious effect upon both of us. But, it only got worse. By now, we again, had to involve the Police. Our Solicitor said that we could apply for an injunction or I could simply block their gate. He did warn us though that this last action could initiate retaliation. However, by now we were so desperate to put a stop to the intrusions that I constructed a blockage that, whilst it did not actually touch their gate, it did prevent them from opening it. Retaliation did occur- almost immediately. On a quiet Sunday morning, men with tools entered our garden via our side gate and proceeded to remove the obstruction. My partner became hysterical and I feared that she was having a nervous breakdown so, I called the Police. Amazingly they were on site within a matter of minutes. I say ‘they’ due to fact that there was also a camera and sound crew and Police PR persons. By coincidence, a team filming for Channel 4’s ‘999 – what’s your emergency?’ was in our Street! After the Police viewed our CCTV evidence, they told our neighbours that, if they entered our property again, then they would face having an harassment order being placed upon them. Also, if they did feel that they had a case, then they should try to resolve it legally. There were now no further garden intrusions but I was subjected to harassment following some chance meetings elsewhere. After 9 months, we were beginning to believe that it was all over, but, we were wrong. The family complained to the local Council’s Solicitor. We received a letter ordering us to remove the obstruction within 14 days or face legal or other action. This, of course, only resulted in more stress, anxiety and expense for us. How much more trauma could we endure? Not much. I am a big man with, so I thought, a strong mental capacity. But, my intense anger added to my immense concern for the mental wellbeing of my partner actually reduced me to tears. During this period of time, she was undergoing radio iodine and chemotherapy treatment for thyroid cancer. This dispute could not have occurred at a worse time. Under all this mental stress, I collapsed and was rushed into hospital. Where I was diagnosed with stress related angina. My partner was left at home alone to try to cope with all this. We had already been prescribed anti –depressants and were attending stress management classes. My partner was by now becoming suicidal. Were it not for the kindness of neighbours staying at her side, she may well have tried. All the while, Litigation continued slowly and with no apparent sense of urgency or concern with respect to our desperate need resolve the issue quickly. Finally, at last, we received some good news. The Council Solicitor wrote to say that the Council would be taking no further action and that, from then on, any dispute would have to be resolved between the two parties. With our garden now once more secure and with no further Solicitor’s letters, our peace was restored and we both began to recover. • Two burglaries and damage to our garden occurred again involving the Police. • And, worst of all, we both suffered long term damage our health. If we did not actually suffer a nervous breakdown, we came so close. All Intrusive Paths are a concern and cause potential disruption to both landowner and tenant. Local Councils in the UK need to be given guidelines to divert or extinguish troublesome paths that may endanger the public or cause concern to landowners through unknown persons coming so close to their homes. Common sense and appreciation of the anxieties suffered by the property owner should be a matter of priority. Sadly, we are not alone. There are many of us with similar problems. Some vindictive people do seem to derive pleasure from causing others distress. They appear oblivious of just what harm they do cause. “The Path & I” is a record of events, which have occurred since 1989 with respect to the Creation and Preserving of Right of Way known as Footpath 28 in the Parish of Maulden, Bedfordshire. For Alan this has been a long distressful battle as well as a great financial burden. ​Newspaper article outlining the ongoing dispute of one of our members. For those wishing to know the latest information about the implementation of rights of way provisions in the Deregulation Act 2015. We understand that the stakeholder working group has produced a comprehensive package of recommendations supported by a finely balanced consensus and that a key recommendation of the group is that the package of reforms is commenced as a whole on a single date. Defra consider that translating such a wide-ranging and complex set of reforms into legislation takes time and that they must make sure they get the details of the regulations and accompanying guidance right so that it is as effective as it can be. They say that with the continuing help and support of the stakeholder working group they are making good progress on the work, but are not yet in a position to say when the package will be put into effect. They add that Ministers are keen that the benefits of the reforms should be realised at the earliest possible date and that an announcement will be made as soon as possible. A petition calling for a radical change in the law regarding Public Footpaths which are presently able to be claimed through private gardens and farm yards was recently sent to Michael Gove, Secretary of State for DEFRA. Mr Gove was told that the 245 people who signed the petition were looking forward to his investigation and intervention into an unjust and undemocratic system. VICTORY for Rights of Way justice! Marlene Masters has at last secured justice for the Peppard family. Too late for Archie and Ivy who have both died before seeing justice done. Our own recent petition included the picture of Archie and Ivy. "Justice delayed is Justice denied" and so true in this case which festered on for 40+ years. Marlene took the Peppards under her wing and fought relentlessly for 25 of those years, giving of her own time and money to help. They were buffeted and bullied by a system that has at its heart a zest for public rights with the willing sacrifice of human rights, truth and natural justice. Watch out for further press articles. One of our members still cannot believe the wonderful news that she has just received. "Following the public inquiry in November and 20 years of hell - we have heard from PINS that the inspector HAS NOT CONFIRMED THE ORDER "
​Those of us concerned with 'Intrusive Footpaths' and the years of frustration, heartbreak and injustice caused to many, share in our members delight at this fantastic news. A MATTER FOR THE COURTS was written by Marlene Masters several years ago. Sadly, her opinion (based on extensive research over 25 years) remains unchanged, as do the serious flaws in Rights of Way procedures. Indications are now strong that Local Authorities believe that the Wildlife and Countryside Act 1981 conferred on them powers to ‘determine’ whether or not a highway exists. In fact, the power to ‘determine’ a highway lies only with the courts. Witness Statements not made on Oath are not being judicially tested, neither is other evidence submitted allegedly in support; however, in many cases all this judicially undetermined evidence is being accepted by local Authorities as evidence to be used by themselves to determine the existence of a highway. In particular – and of most concern – is the fact that claims made under Section 31(1) of the Highways Act 1980 – disregarding Section 32 of the same Act – and are being subsumed into Section 53 of the Wildlife and Countryside Act 1981. Section 3 of the repealed Rights of Way Act 1932 was copied and faithfully re-enacted in both Section 35 of the Highways Act 1959 and Section 32 of the Highways Act 1980. There appears to be a misunderstanding of Section 32 of the Highways Act 1980 – and the essential requirement to satisfy a court or other tribunal on the evidence – which should be properly tested, that a highway does, in fact, exist. With the exception of Sections 25 and 26 of the HA 1980, NO ACT has extended any powers beyond the courts to determine whether (or not) a highway actually exists. Local Authorities all over the country appear to be following guidance (or each other) in the belief that the Wildlife and Countryside Act 1981, which was designed to protect wildlife and the countryside, has somehow conferred upon them additional powers to ‘determine’ the existence of a highway. That role has always been exclusive to the courts. There appears to be a deep misunderstanding that the local Authorities are in fact “a court or tribunal” for the purposes of Section 32 of the HA 1980 and Section 53 of the Wildlife and Countryside Act 1981. There was, in fact, no amendment of Section 32 of the Highways Act 1980 and no transfer of power from the court to Local Authorities in the 1981 Act. Local Authorities all over the country are seen to be acting in the misguided belief that their powers are now equal to those of the courts or tribunals. This cannot continue and clearly something must be done to rectify this very serious problem. 2 stories which should be considered Intrusive​. The 1st one is a Footpath which goes through 2 doors! The 2nd public Inquiry will be held next year, at present the residents have keys for the doors which are kept locked. You can find the newspaper article here. The 2nd one is that, cyclists are now trying to legalise cycling on footpaths, This is against the law at present, however very few cyclist adhere to this law, Cyclists have miles and miles of cycle lanes financed by the Councils but, as they say, they do not legally have to use them and so many choose to continue to cycle on the roads alongside the cycle lanes. They say "We can use only 21 percent of Wales' rights of way and 22 percent of England's and frankly, thay's not enough. But we won't get any more trails unless we make our voices heard. That's where OPENMTB and CYCLING UK come in." Together they’ve launched the first national survey of off-road cycling activity in England and Wales. The survey will allow them to “establish an accurate picture of riding behaviour – and how it fits with the present access arrangements in England and Wales.” This information will then be used to help further efforts to open up rights of way. In short, this is the time to tell everyone you do actually ride some cheeky footpaths and maybe it would be better if they were just made legal. The problem is, it closes on Monday so you need to get your responses in ASAP. Share it around too, the more people who fill it in the better. If you need any more incentive one respondent will win an iPad too. Why not send us your own thoughts, concerns or articles? 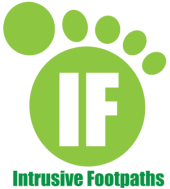 Just email us at getinvolved@intrusivefootpaths.org.uk we will publish what we can right here. I just wanted to say thank you keep up the good work! After 16 years of, well “battling" from the early nineties followed by more sensible but tricky negotiation and canvassing, we have finally managed to get our bridleway and footpath diverted away from the middle of our busy farm/courtyard to the middle of one of our fields. The process has been so stressful and debilitating for many years but by standing our ground and attending various meetings with objectors and the local council over some 16 years we have finally managed to negotiate a sensible and agreeable outcome for all. The final diversion order which we received last week was a massive relief and cause for celebration but the thing that I’m most happy about is that in the end after all the heart ache and fighting that sensibility, compassion, and understanding on both sides has resulted with us now on friendly terms with the local Ramblers, the Horse Society, the local Council, walkers and horse riders, many who are congratulating us on providing them with a much nice and safer route. I send this not to gloat in any way, I know that we have been fortunate, but I did want to send a positive story to send strength to you all and thank you all for the support your emails have given me not to give up. After High Court appeals, letters to transport commissions, local MP…etc... we can at last begin to enjoy our home and business to the full, safely and securely. Our youngest has just turned 18yrs and has never had the freedom we had hoped to give him when we bought the farm due to security and safety issues of the rights of way, and he has only ever known the continual battle and frustration, however now we can look forward to his children having the freedom, and safety, as well as us busy at work knowing a horse isn’t going to get spooked at the machinery in the yard and through it’s rider off onto the concrete. Massive thanks to you all, and I’ll keep supporting you all; just got the family to sign the petition. 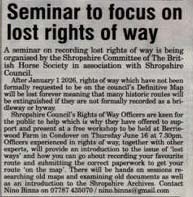 Shropshire County Council are supporting free workshops for the British Horse Society to claim 'lost' rights of way. 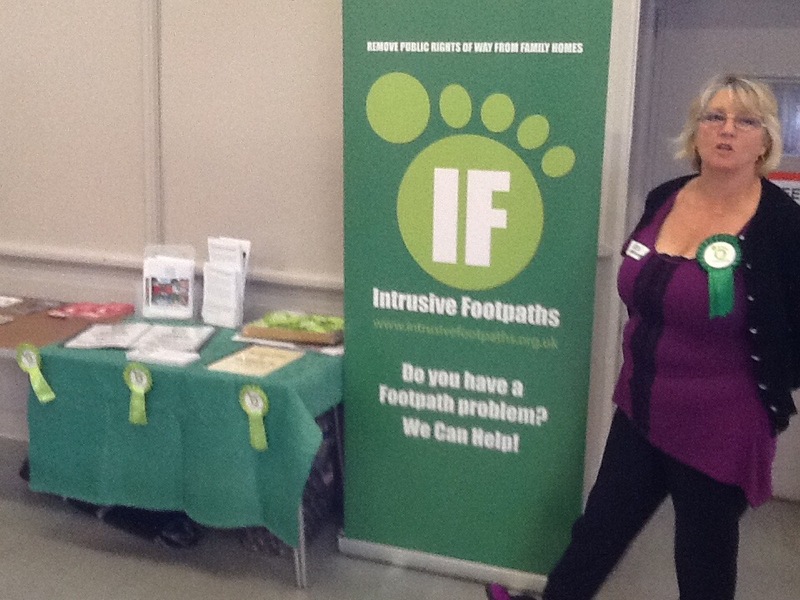 Council Rights of Way Officers are even preparing and presenting these seminars. Councils already have a back log of hundreds of applications and this is certainly not how officers should be spending valuable time. No Council has the authority to spend money from the "public purse" helping Applicants claim alleged "lost" public Rights of Way. This is tantamount to canvassing in order to bolster Applications. This is simply NOT allowed and County Councils do not have the power or authority to do this. It is also quite immoral for Councils to show favour to one particular single issue pressure group. The British Horse Society have their own funds collected from public donation. They should NOT be entitled to 'free' publicity and canvassing from County Councils. ​If you see similar incidents of council involvement in these sorts of seminars please make your views known to the media and the council concerned. Terminology confusing you? Click here to see our Glossary. To change the law on rights of way, so that members of the public can file legitimate claims against footpaths intruding on their homes, gardens and driveways. ​Do You Have a Footpath Problem? Historically Rights of Way were functional not recreational. Definitive Maps based on paths walked by volunteers with no knowledge of rights of way in 1950 are often inaccurate and survey cards often hold very little information to define the correct route or features on the route. The legal system around rights of way is archaic, imprecise and presumes in favour of the walker, with homeowners having few, if any, rights. Legal protection of family homes in Scotland has recently been recognised and provides a common sense approach. For more information please see http://www.legislation.gov.uk/asp/2003/2/section/6. This Act has now been introduced, reference http://www.gov.scot/Topics/Environment/land-reform.